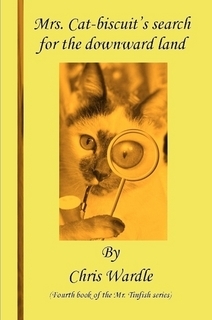 We have now reviewed all five books in the Mr. Tinfish series by Chris Wardle. It’s been awhile since we featured the first three, so I’m going to talk about this series as a whole. With Christmas coming soon, this series of books would be an excellent gift for the young person in your life ages 7 – 12, though I think readers older than this would still enjoy the humor and the relationships between many of the characters. We are first introduced to Mr. Ginger, Mr. Choli, the Tinfish family, and some of the other characters that you’ll become familiar with during the series, in The lighthouse of Mr. Tinfish. In this book, the rising sea levels caused by climate changes put the homes of the members of the colony in danger. Mr. Vinegar, who the reader soon learns is known for stating the obvious, is the leader of this colony. He enlists the help of their resident detectives, Mr. Ginger and Mr. Choli to find a new location for everyone to live. 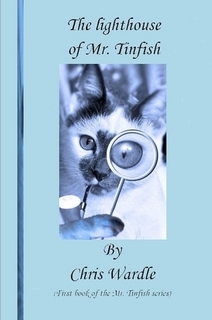 You can find my review of Book 1 in the Mr. Tinfish series here. At the time, I felt this would be the start of an amazing series. This definitely has been the case. By the time we catch up with the residents of the colony again, they have moved into their new location and called it Daphne Wood. In Mr. Choli’s River Trip, Mrs. Cat-biscuit, the goat, has expressed concern that the vegetation in Daphne Wood is struggling to survive against the heat and wind. While Mr. Ginger and Mr. Choli lead a new expedition to find plants that can thrive under these conditions, Mr. Denzel, the mole, is busy in Daphne Wood leading a project that will protect the current vegetation in the colony. You can read my review of Book 2 here. When we get to Book 3, Mr. Vinegar and the Frozen Sea, we have a good idea what is going to happen: the residents of Daphne Wood are going to face new challenges, members of the colony are going to be sent off on an expedition, and by pulling together they will do what they need to do to save the colony. One might think that the repetition in format for each book would be boring, but that’s far from the case. Wardle does a superb job of adding in new characters and building upon the previous books in the series to continue to engage the reader. And while the challenges they face are all due to climate changes, the nature of those issues and their solutions vary. In Mr. Vinegar and the Frozen Sea, winter comes to Daphne Wood, and the fish supply is dwindling as the ice shelf continues to shift and thicken, making fishing much harder than it used to be. Since the forest had been wiped out by previous wildfires, they’ve also had to travel farther out to find new crops that can withstand the hot, dry conditions of Daphne Wood. You can read my review of Book 3 here. I have to admit that this book remains my favorite out of all five. Mrs. Cat-biscuit’s search for the downward land is the fourth book in this series. We just reviewed this one, so I won’t go into too much detail, but again, I have to say that the addition of new characters and the issues that the residents of Daphne Wood must face, adds a great deal to this book. The characters we have seen throughout the series continue to develop and serve the colony. Wardle’s characters are definitely his strong point, but he also proves as the series continues, that he does a fine job of showing the growth in his characters, like William Tinfish’s ability to help solve problems and Mr. Ginger developing his culinary skills. You can read this review here. In the fifth and final book of the Mr. Tinfish series, Mr. Ginger and the disappearing fish, we find that once again, lack of food endangers the colony. This time, the warming up of the water has caused the fish to move to a new location where the water is cooler. Tons of seabirds in search of fish are now roosting on Mr. Vinegar’s roof and the cacophony is unbearable. Mr. Ginger needs fish for his recipes, Mr. Choli can’t stand the noise, and Mr. Vinegar is afraid of what they are doing to his roof. It occurred to me by the fourth book in the series that it is a bit funny the main characters are all animals, yet fish are merely a food source. It has to be that way, but it did cause me to chuckle. Since it comes up again in Book 5, I got to laugh all over again. 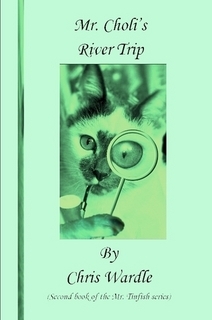 As I mentioned in my review on Wednesday, while I am disappointed I won’t have any more books in the Mr. Tinfish series to read, I was very satisfied with how the author left everything with the residents of Daphne Wood. There were no loose ends that left the reader hanging. He can go on imagining what the potential new crisis might be for the colony or he can imagine that they get a break for awhile and the colony thrives with all the improvements they’ve made. You can read my review of Book 5 here. My only nitpick is a problem I mentioned when I reviewed Mr. Vinegar and the Frozen Sea, which continued to plague the series in the final two books: typographical errors. Self-publishing often gets an undeserved bad reputation for quality, but the number of errors in the last two books were a bit distracting. There were missing words or wrong words used and sometimes the same word would be spelled differently throughout the book. I don’t like to find these types of errors when I am reading any book, but especially when you’re writing for a young market where you’re trying to encourage reading over playing video games, chatting online, or watching television, the author needs to offer a story that keeps mistakes to a minimum. That aside, I will be holding onto these books and sharing them with my girls. I think the Lil Princess will get a big kick out of the quirky characters in the Mr. Tinfish series, and will learn a lot about climate changes, cooperation, and problem solving in the process. It’s time again–actually, this is past due–for From the Family Bookshelf–the weekly (so far, so good) column talking about the books we’re reading, have read or want to read. There’s Mom (me), Dad (slowest reader in the world), the Lil Diva (reluctant reader extraordinaire), and the Lil Princess (bookworm in training). I’ll let Dad go first this time, but that’s because I’m going to pick on him. Yes, he is still reading the thriller, Prayers for the Assassin , by Robert Ferrigno. Can you imagine how big my TBR pile would be if I read as slow as he does? The Way I See It: A Look Back at My Life on Little House a memoir by Melissa Anderson. Anderson played the character of Mary Ingalls on the classic 70’s family show, Little House on the Prairie. Some of these reviews have been posted here: Jack’s Dreams Come to Life, The Raindrop, Mr. Vinegar and the Frozen Sea, and The Soggy Town of Hilltop. Tom Weston’s book will be reviewed here on Friday. My review of Melissa Anderson’s book appears at Laura’s Little Houses, my Laura Ingalls Wilder blog. The other books will be reviewed at The Book Connection. I just started reading the novel Conflicts with Interest by Michael Ruddy. I’m also reading The Three Dimensions of Character by Larry Brooks. Wow! I take a up a lot of space. Now onto the girls. The Lil Diva is still in Justin Bieber heaven, but she is managing to get some other reading done. She just finished Junie B. Jones Loves Handsome Warren (RH Books for Young Readers) by Barbara Park. There are few books I can get her to read without an argument. Junie B. Jones books fall in that category. The Lil Princess has read a few books this week. Now that she’s beginning to recognize more words she wants to read to me at night instead of the other way around. Two books I remember from this week are The Silly Scarecrow by Danielle Denega. This is a Clifford Puppy Days book from Scholastic geared toward kids in K – 2. Her other popular book of the week is What Do Smurfs Do All Day? by Peyo. This book is part of the Dr. Seuss Beginning Readers Collection. I’m sure it belonged to my son, who watched Smurfs, as did my sister and I when we were younger. My sister had the Smurf village toys that were popular when the cartoon first came out. The Cartoon Network was airing reruns of Smurfs for a while and my girls really liked the show. A great show, like a great book, never goes out of style. Mr. Choli, Mr. Ginger, the Tinfish family, and the others from Daphne Wood return in Mr. Vinegar and the Frozen Sea. Winter has come to the colony. While Mr. Choli, the head detective, has managed to gain a lofty reputation based upon his previous adventures to help the colony survive after the sudden climate changes impacted the community, the winter has brought on a whole new set of problems to be addressed. The fish supply is dwindling and the ice shelf continues to shift and thicken, making fishing an arduous chore. Other supplies are low too. When Mr. Vinegar suggests another expedition, this group of adventurers begins putting together their plan. Of, course, no one figured that Mr. Vinegar planned to come along. Chris Wardle’s series of quirky characters returns in this third installment featuring the cats, Mr. Choli and Mr. Ginger. As with The Lighthouse of Mr. Tinfish and Mr. Choli’s River Trip, the animals left behind after the sudden climate changes forced them to leave their homes to seek out a new place to live, continue to deal with issues that are a matter of life and death. The community in Daphne Wood is made up of a diverse group of characters: cats, birds, squirrels, penguins, a walrus, a polar bear and more. Each animal having its own food and shelter needs, the members of the colony have worked together to ensure everyone’s survival and comfort. Winter becomes a large obstacle for them to overcome as their food supplies dwindle. The forest being mostly wiped out from previous fires, means the colony must seek new plants farther away and bring them back to Daphne Wood. These will have to be drought resistant crops, since the overwhelming heat of the summer burns the plants and makes it hard for them to grow. Wardle introduces more new characters in this book. Amazingly, each character is unique and has some type of quirk that will leave an impression on the reader. The creation of these zany characters is definitely Wardle’s strong point. That the animals have managed to work together for so long for the betterment of everyone, provides young readers an excellent example without being preachy. The illustrations add a special touch to the book. I enjoyed the second book in the series better than the first, and this third installment is my favorite. Wardle consistently puts together fun, humorous stories filled with adventure that address the global issue of climate changes in a way that children will enjoy. If the author takes the time to seek a copyeditor to clean up the typographical errors, future books in this series will be perfect. Mr. Vinegar and the Frozen Sea is a delightful read that kids will devour with zest.